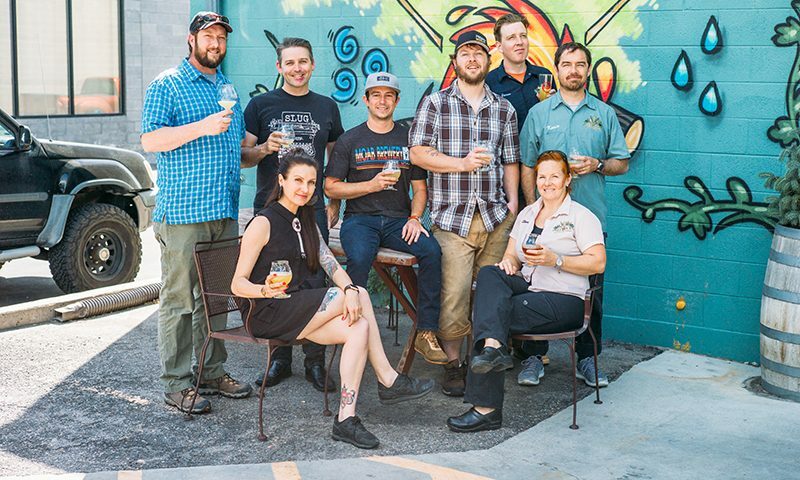 (L-R) Kevin Crompton of Epic Brewing, John Ford and Angela H. Brown of SLUG Magazine, Scott Davis of Moab Brewery, Rio Connelly of Proper Brewing, and Jaron Anderson, Shantel Stoff and Kevin Templin of Red Rock Brewing Co. Photo: @clancycoop. Nine years ago in 2008, SLUG decided to give local beer an entire month and created Utah’s first Beer Issue, which was solely dedicated to Utah’s beer culture. 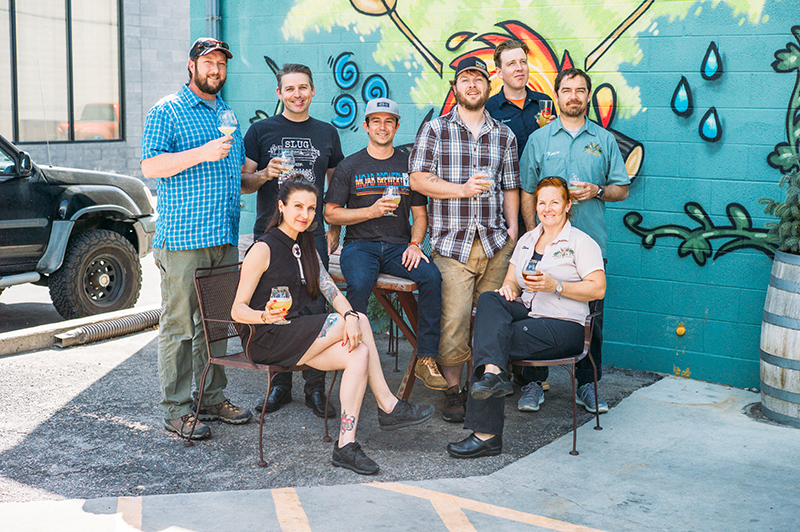 Since then, we’ve continually examined the artisanship and complexity of local craft beers, elevating Utah’s offerings against the rest, and have heralded the passionate people behind them. Year after year, the Beer Issue has become a typed-out map of Utah’s burgeoning landscape of craft beer. 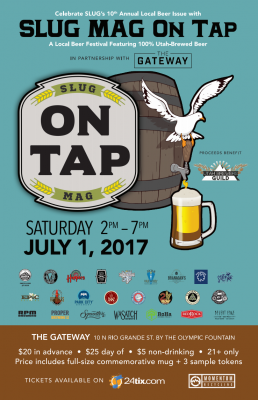 It is by this 10th Annual Beer Issue that we bring you the first 100-percent Utah-brewed craft beer festival: SLUG Mag On Tap. After nine years, the child of SLUG’s Beer Issue will finally come to life on July 1 at The Gateway. Every beer featured will be from this oddly wonderful state of Utah, and a portion of the proceeds will benefit the Utah Brewers Guild (UBG), a nonprofit organization that advocates for Utah craft brewers. SLUG Magazine’s Beer Issue was created with the idea of something more. “I’ve always envisioned a companion event to the Beer Issue,” says Angela H. Brown, Executive Editor of SLUG. “SLUG’s annual Beer Issue is one of our most popular issues. Our coverage is distinct, and the angles we approach each year’s theme with are unique.” This is evident from the simple illustrations of the first Beer Issue to the areas of personal expertise per brewery/brewer in this very issue. “The Brewers’ Guild was interested in getting its own festival off the ground, but as a nascent organization, we don’t have a ton of resources to drop, so we were looking for a partner,” says UBG Vice President and SLUG alumnus Rio Connelly. “One of our board of directors set up a meeting with the Mayor [Jackie Biskupski]. She was very gracious, but she pushed us to seek other things, including her suggestion, which was Craft Lake City.” Recognizing that the Craft Lake City DIY Festival is a family-friendly event, Connelly thought of its sister organization, SLUG Magazine. He says, “Serendipitously, Angela had already been thinking about a beer fest to kick off [SLUG’s] 10th Annual Beer Issue, and it just kind of worked out perfectly: We were looking for a partner, SLUG was looking for some professional help in the world of beer, and we were able to symbiotically work together.” Now we want to invite people to a beer festival of Utah’s best—an all-star lineup born from years of our thoughtful, critical indulgences and local beer coverage. In addition to celebrating Utah’s local breweries, SLUG and UBG will launch a scholarship fund for a young brewer to become a Certified Cicerone® in memory of former SLUG wonder kid and beer reviewer Kyle Trammel (who was also a close friend of Connelly’s and encouraged him to open Avenues Proper). Trammel consistently set a tone of clever, confident expertise, laying a foundation for the passion and diligence that SLUG writers aspire to achieve. With Brown, Trammel consulted local professionals in the industry to put together SLUG’s first beer-themed issue in 2008. It’s through Trammel’s legacy that this article—and this 9th Annual Beer Issue—sits in front of you, making him the heart of SLUG Mag On Tap. “Nine years ago, we saw an opportunity to shine a light on the incredible beers that our local breweries were crafting,” says Brown. “An emerging Utah industry was brewing, and no one was talking about it in any of the local media outlets.” Hence, we’ve cultivated content that uncovers and informs about Utah’s vibrant beer scene for our readers. “Through SLUG’s comprehensive beer coverage,” says Brown, “we hope that we’ve inspired others to get involved with Utah’s brew scene.” So now that leaves us with you. I suggest sunscreen and big floppy hats. Water is located throughout, so hydration is not a concern. There will be plenty of shade, and The Gateway directs airy breezes along Rio Grande Street for walking comfort. We’ll have tables for friends and plenty of room for enthusiastic conversations. There will be local food vendors providing delicious options for every taste, and we will be working to bring you every ounce of this experience that we can squeeze out. I’m sure dancing will happen with our local DJ lineup, so please partake. 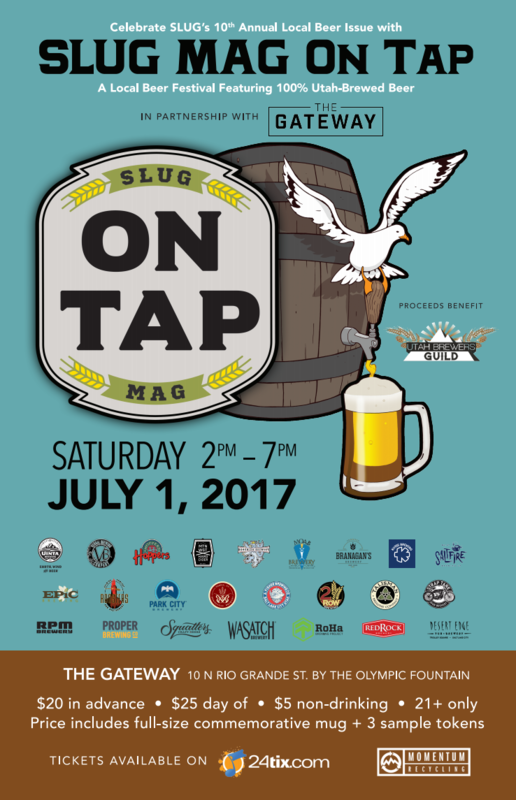 SLUG Mag On Tap is Saturday, July 1. Presale tickets are available for $20, and day-of tickets are $25. The event is 21-plus, but we will also have $5 tickets available for non-drinkers, with nonalcoholic drinks available for designated drivers, including a Red Bull mocktail station and more. Each ticket includes three sample tokens and a full-size commemorative mug, which I’m sure you’ll know what to do with. For more information, visit the SLUG Mag On Tap event page. Editor’s Note: The original version of this article incorrectly stated Rio Connelly’s Utah Brewers Guild title. The changes have been amended.